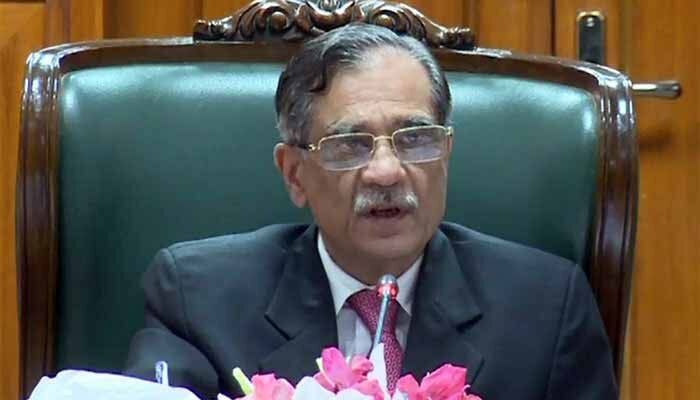 ISLAMABAD: Chief Justice of Pakistan (CJP) Mian Saqib Nisar has said it is not the judiciary’s job to build water reservoirs in the country, and that it is the responsibility of the executive. His comments came weeks after he had initiated the donation fund for the Diamer-Bhasha and Mohmand dams. The CJP said that the apex court could only maintain a supervisory role — concerning the collection of funds for such special projects — in the name of transparency. “The Supreme Court will not interfere in awarding contracts, nor will it meddle in the designing and structural plans of the two dams, but will ensure that no one makes illegal commissions, or embezzles the funds allocated for the projects,” the CJP said while heading a three-judge bench hearing a case pertaining to the fund-raising for the dams. On July 4, the Supreme Court had ordered that an account be opened for the purpose of collecting donations, directing the government, the Water and Power Development Authority (Wapda), as well as the executive to take immediate action after the Council of Common Interests unanimously decided to construct the two dams. Senior counsel Barrister Aitzaz Ahsan also suggested during the hearing that the court maintain an advisory role, and let the executive take responsibility for the construction of the dams. The court, however, seems to have deliberately avoided talking about the Kalabagh dam considering its controversial status among the provinces. Nevertheless, the bench observed that the Kalabagh dam would require a consensus among the nation. The CJP further explained that it was not the job of the judges to collect funds, but did claim that someone had handed him a cheque for Rs500,000 — in a recent visit to a shrine — to be donated into the fund. The CJP added that he believed people in the country had realised the importance of water conservation, and were also determined to contribute to the fund. However, overseas Pakistanis, he claimed, were finding it difficult to make donations. State Bank governor Tariq Bajwa informed the court that contributions from expatriates had started pouring in from the United States and Germany, but those living in the Middle East were having some problems considering they must gain an approval for sending money to Pakistan. Justice Umar Ata Bandial, a member of the bench, said that the court had to take up the issue of constructing the dams because it was a matter of national importance — one that was critical for the unity of the nation. Moreover, he said, the people have severe apprehensions over the transparency mechanisms in the fund collection process — especially after their experience with the 2005 earthquake funds that were misappropriated. Justice Bandial also said that it would be a good idea to get schoolchildren involved in collecting the funds. The court also dropped hints of taking up the issue of taxes and surcharges on electricity prices, pointing out as an example, a monthly bill of Rs23,000 that included a major chunk of Rs8,000 in taxes. Instead of curbing power theft, the authorities are dishing out inflated bills to people who cannot even afford a decent life, the court regretted.